I’ve struggling with this question and been fascinated by this question all week. I heard Cory Booker say this on Oprah and the question hasn’t left my thoughts since. I want to apply this to my life. I want to ask myself this question before I make any decision from now on. I don’t even want to look back and think how the fear of failure has influenced decisions in the past. I know it has but I need to look forward. With my 40th birthday now 18 days away, what I’m struggling with is how I apply this question to my life now? It’s the question I want to have an answer for in the next three weeks. 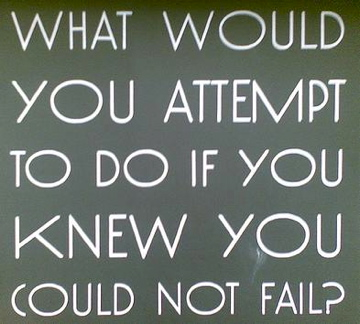 What would I do now if I wasn’t afraid to fail? The answer to that question is the path I want to pursue in the next decade. Nick Wooster is an icon to this blogger. Obviously he is a man with supreme confidence. Love the look. I may pursue that jacket. PS: I love the photo so much, could I possibly have permission to re-use it sometime? If not, it’s ok, but I can think of a hundred great messages that go with that fabulous photo. Thanks! Feel free to reuse any of the pictures or reblog the post. The old adage “failure is not an option ” comes to mind. But what is so wrong with failing? Sometimes it teaches us our most valuable lessons. Thomas Edison failed innumerably before he invented the light bulb! I say we embrace our failings and become stronger and more confident for it! I agree. Thanks for your comments and thanks for stopping by the blog. Please come back again. One year on from my 40th, and I’m still struggling with the answer to that question. Actually, not the answer so much, but what to do with the answer. There are a number of things I would do if failure wouldn’t result in me losing everything I have worked for so far. All the inspirational quotes in the world won’t help when it comes to real life decisions. It sounds great in theory, rising every time we fall, and learning from our failings, but sometimes reality dictates that it’s a really dumb idea to go chasing pipe dreams. Sometimes we just have to let those dreams go, and realise we have come too far to put it all on the line. It’s at these times that we learn to embrace our lives as they are and rather than constantly rue missed opportunities, appreciate the ones we have taken. Yes, it’s something I struggle with all the time. Risk versus reward. I have no idea what the answer is. But, the question serves as a good starting point for the decision making process. Thanks for your comment.